I had no idea what to expect from Ben Affleck's bank robbing romance set in Boston. I hadn't seen a trailer and not read a thing about it and therefore my expectations weren't at fever pitch. I did however love it from the get go. 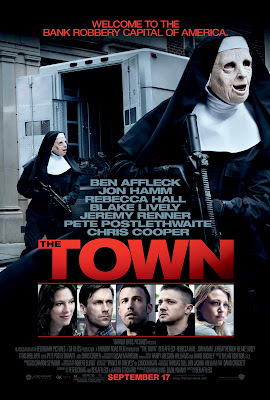 The opening scene as Affleck's team of criminals hold up a bank, with crazy monkey masks on, is high octane, but what follows is a classic gangster flick, set on the tough streets of Charlestown, that's as much a thoughtful study of a man wrestling with his life as it is a thriller. That Affleck stars and directs suggests that there's more talent in one of Kevin Smith's muses than many would have suspected. It's beautifully shot, the direction and small touches, that I'll be honest AT picked up on way more than I did, add colour and authenticity throughout. During the initial heist the gang abduct the bank manager but let her go shortly after they escape, taking her driving licence and discovering that she lives just around the corner from them. Affleck's character and leader of the group (Doug MacRay) persuades the rest of the gang, which includes the excellent Jeremy Renner as James Coughlin (The Hurt Locker and The Assassination of Jesse James), that he will make sure that she doesn't know who they are. Rebecca Hall is Claire Keesey, the victim of the abduction, and MacRay follows her, deliberately introduces himself to her in a laundromat and, inevitably rather than decide they're better off with her dead, falls for her. Affleck does a great job of showing the conflict within his character. He wants out of the life he leads but we see him commit at least four more crimes as he tries to balance the life he wants with the one he has. Jon Hamm (Mad Men) is superb as the FBI agent leading the charge to catch the gang although my only issue with the film is how useless the FBI are portrayed, seemingly, as being. One minute they're outside the gang's house taking pictures of them having a BBQ the next the gang is holding up a security truck or planning its next heist. Maybe it's a dig at a lack of resources and there's a throw away line early on that, '...if your suspect isn't a potential terrorist you get no funding,' but it just doesn't ring quite true. However Hamm does a good job of making his character more than one dimensional, in what is, a pretty one dimensional role. The relationship between Affleck and Keesey feels real and you're genuinely moved when the reveal comes. There's some great yet small roles for Chris Cooper (Adaptation) and Pete Postlethwaite (The Usual Suspects) which helps to bring some some of the minor characters to life as MacRay's life starts to unwind around him. One of the Ledgers (Mike) called it last night, 'If that had been made by Scorsese people would be going nuts about it.' AT is describing it as... well I'll let him tell you that tomorrow. It's not going to be at the cinema for long but this is a keeper of a movie. One that in 10 years time the Ledgers will put on after a day watching football and drinking, where we'll know what killer line is coming next and what bullet is going where and through who. It deserves to be seen by a bigger audience. Almost faultless. Go and see it while you can.